What Does the Arno Motion Do? 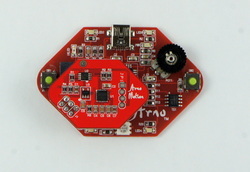 It adds an Accelerometer and Gyro to your Arno or other Arduino project. We've been playing with quadcopters for a few years and are amazed at the improvement in sensors. When the MPU-6050 came out, we started using it for quadcopters. The problem is that you had to build your own board or use a 3.3V I2C system. Neither of these is a good option to get a project up and running quickly with Arduino. 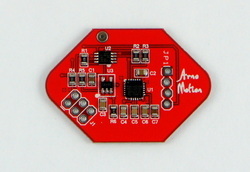 The Arno Motion works on 5V power and I2C. We've also modified existing code to let you use Software I2C to communicate with the board. This let's us add it to an Arno and opens up some project options for other applications. There are a few libraries out there that work well with the MPU-6050. To work with the Arno we'll be using software I2C. For starting out we chose the one with a post in the Arduino Playground, SoftI2CMaster. Click here to go to the page and follow the Installation instructions. When you get to GitHub use the Download ZIP button on bottom right of the page. To install place in the libraries folder in Arduino. If you are using an Arduino other than the Arno, you can still use this option or you can use Wire and i2cdevlib or other examples. This is a graphical representation of x&y data on your computer using a processing sketch. This is fun to watch and a simple way to try out integrating Arduino with Processing.